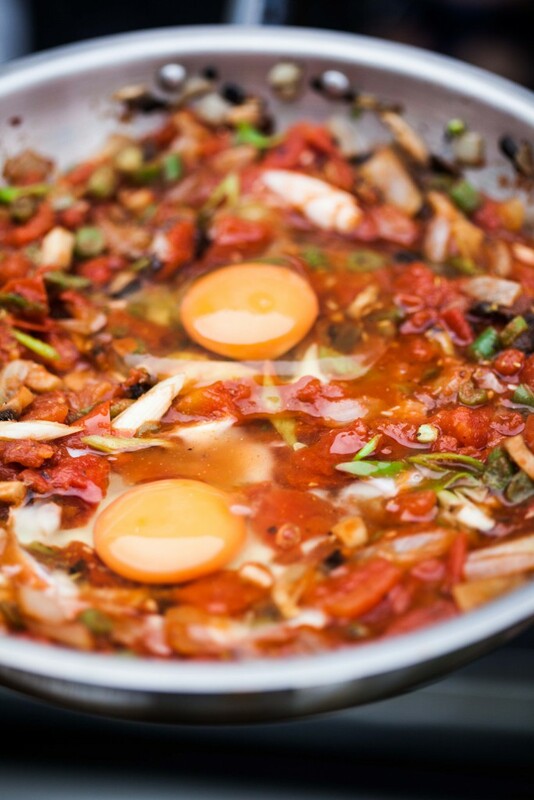 Shakshuka, sounds so exotic and foreign to me actually. The first time I came across it was when brunch places in Singapore started to have it on their menu a couple of years back. Curious, I tried it and fell in love with it. I did some research on my own. A little bit of background, shakshuka is North African, Tunisian to be exact in origin, and it means ‘mixture’ in Arabic (thanks Wiki). And that it is. 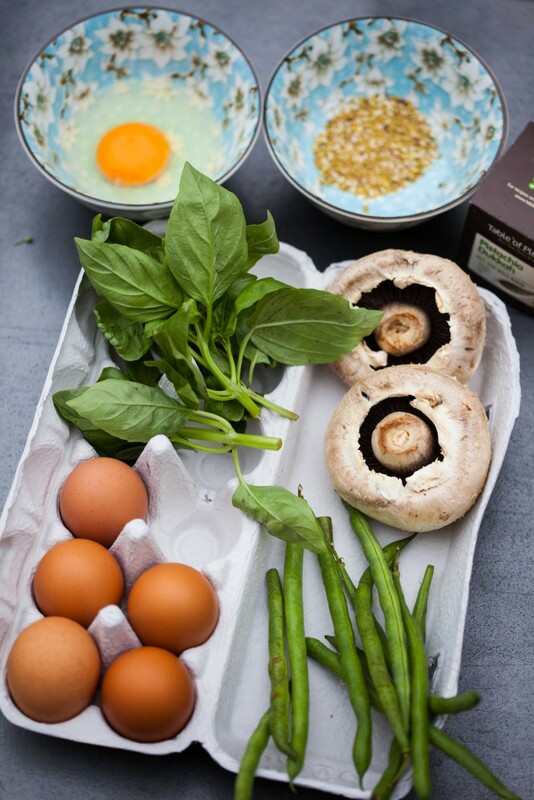 It’s essentially slowly cooked eggs but it’s got a whole mess of tastes and textures to fill out all its nooks and crannies: slippery onion and bell pepper, a spicy and fragrant tomato sauce, salty briny crumbly feta, the cleanness of fresh scattered cilantro leaves. And to top it all off, barely-set eggs that tumble into puddles of yolk when prodded. Doesn’t that sound amazing? To me, it’s a dream. I think it can even be the star one pot meal at important dinners! Kids friendly, budget-friendly, waistline-friendly, no time to cook-friendly, vegan-friendly! Great for clearing leftovers vegetables in the fridge, too. I actually whipped a quick one during our fifth day in Perth. Heat oil in a pan on medium heat, add onion and garlic, stirring occasionally, until soft and golden brown, about 5 minutes. Add bell pepper, mushrooms, french beans, or whatever leftover veggies, cumin, paprika, chillies and cook for another couple of minutes. Pour the tins of chopped tomatoes into the pan and let cook, covered, for 15 minutes until thickened slightly, stirring occasionally. Season with ½ tsp salt. 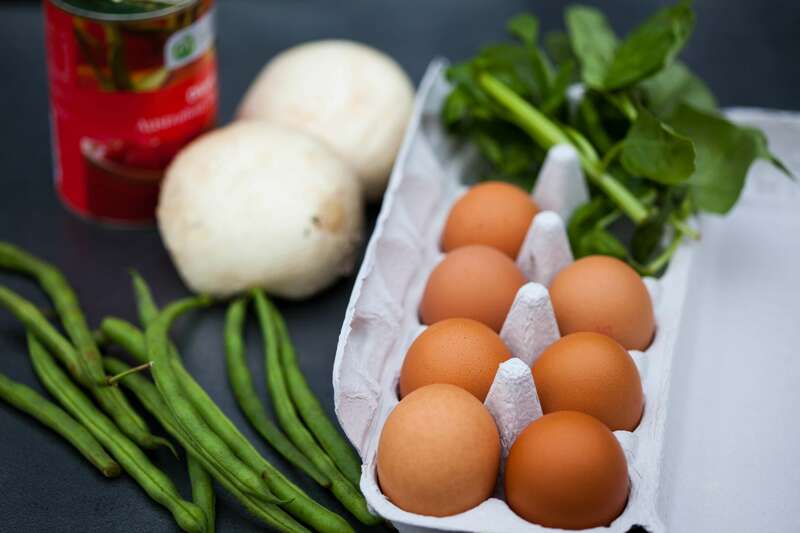 Make small holes in the sauce for the eggs and carefully crack the eggs into them. Cover the pan with a lid and cook for 5 minutes, until the egg whites have set. Serve with hand torn basil leaves and sprinkle the crumbled goat’s cheese onto the surface of the shakshuka. Add chopped parsley or coriander leaves if desired. 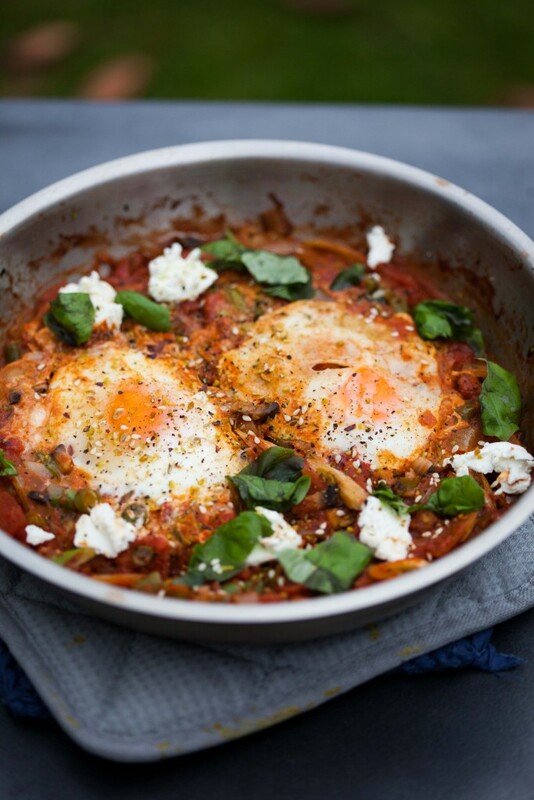 Sprinkle more dukkah on the shakshuka if you love dukkah like me. Serve with crusty bread or warm flat breads. Tip: As this is can be made with leftovers in fridge, it is good way to make good ingredients that are left a little each and good to help clear the fridge before a weekend shopping trip to the supermarket. Spinach makes a good addition and gives this essentially red dish some spurts of green goodness. Addition of chorizo or any sausages to this dish makes it fantastically good.